امروزه در جامعه ما، اهمیت مناظره در رسانه ملی و نیز اجتماعی بودن کسب معرفت موجب شده است که برای تأثیر مناسب این روش بر مخاطب، به یافتن قواعد خاص مناظره و استدلال پرداخته شود. قواعدی که به فرهنگ اجتماعی و به موقعیت و شرایط شناختی انسان‌ها ارتباط پیدا می‌کند؛ این قواعد، بهترین روش برای رسیدن به باور صادق و موجه، در برابر استدلال‌ها و باورهای نادرست هستند. رعایت این قواعد موجب اعتماد مخاطب به رادیو و تلویزیون می‌شود و امکان کنترل افکار اجتماعی را فراهم می‌کند. مناظره، ضمن آنکه ساختار تصویری و فنی نمادینی را برای اجرا طلب می‌کند، از محتوا و منطق درونی خاص خود نیز برخوردار است. تلویزیون به دلیل حساسیت‌های مخاطب و پیام، نیازمند کشف و رعایت این اصول و قواعد است. مقاله حاضر، قصد دارد استلزامات و مفروضات مناظره را در رادیو و تلویزیون بررسی کند و در چهارچوب نظریه معرفت‌شناسی اجتماعی، قواعد مهم و تأثیرگذار و اصول حاکم بر مناظره و استدلال را در رادیو و تلویزیون برای اعتماد‌سازی متقابل میان نظام سیاسی، فرهنگی و شهروندان تبیین می‌کند. assistant Prof. in political science of Ferdowsi Mashhad Uni. Today, the significance of debate in National Media and socialization of the process of knowledge-seeking get us to address and explore debate and argument’s principles related to humans’ social culture and cognitive situation. Such principles are the best way to reach justified and faithful views against wrong arguments and tenets. Observing these rules and principles may bring about the audience’s trust on TV and radio and, hence, the control of public opinions. Requiring a visual-technical symbolic structure for implementation, debate enjoys an intrinsic logics and content of its own. Due to the sensitivities concerning audience and message, television needs to discover and observe such principles. The present article aims to examine the requirements and propositions of debate on television and radio and find an answer to the fundamental questions that what qualities characterize a proper debate and argument and what principles and regulations govern TV and radio’s debates. Based on an epistemological framework, this study sheds light on these important and effective principles which are necessary for mutual confidence-building between political, cultural system and citizens. آشتیانی، منوچهر. (1383). جامعه‌شناسی شناخت (مقدمات و کلیات). تهران: مرکز. انصاری، منصور. (1384). امکانات دموکراتیک اندیشه‌های میخائیل باختین و یورگن هابرماس. تهران: مرکز. شمش، منصور. (1387). آشنایی با معرفت‌شناسی. تهران: طرح نو. عبداللهی، حسن. (1387). درآمدی بر روش‌ها، فنون و مهارت‌های تدریس. تهران: انتشارات دانشگاه علامه طباطبائی. مایرز، گیل و مایرز، میشله. تی. (1383). پویایی در ارتباطات انسانی (ترجمه حوا صابر آملی). تهران: انتشارات دانشکده صداوسیما. 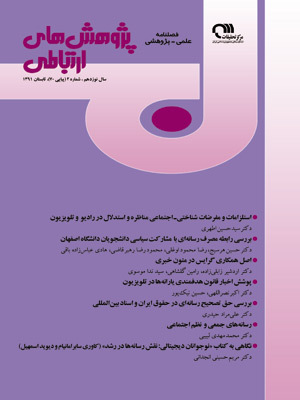 هابرماس، یورگن. (1387). نظریه کنش ارتباطی (ترجمه کمال پولادی). تهران: مؤسسه انتشاراتی روزنامه ایران. Blair, A.J. & Johnson, J.R. (1987). Argumentation as Dialectical, Argumentation. Vol. 1, No 1, Pp. 41-56. Goldman, A. (1986). Epistemology and Cognition, usa: Harvard university press. Goldman, A. (1988). A Theory of Human Action, englewoodcliffs: Prentice-Hall. Goldman, A. (1999). Knowledge in a Social World, Oxford: Oxford University Press. Meiland, J. (1989). Argument as Inquiry and Argument as Persuasion, Argumentation, Vol 3. Pollock, J. & Cruz, J. (1999). Contemporary Theories of Knowledge, boston: Rowman and Littlefield. Siegel, H. (1989). Epistemology, Critical Thinking, and Critical Thinking Pedagogy, Argumentation, Vol. 11, No. 11, Pp. 127-140. Tannen, D. (1990). You Just Don't Understand: Women and Men in Conversation, New York: Random House, p. 171. Wallace, C. & Nichols, J. (1986). Evidentiality: The Linguistic Coding of Epistemology, Norwood: Ablex press.